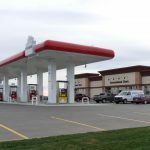 When you’ve been in the same store for decades and it is time for an update, are you better off to renovate… or tear down and rebuild from the ground up? That was the question facing the owners of the Brooks Red Basket Store. A tear down would be costly but would give them exactly what they needed. 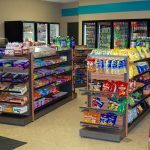 A refresh would be more economical, but would the changes be different enough and meet the functional needs of a modern c-store? The Red Basket owners turned to Mark Walsh for a professional opinion. Mark evaluated the building top to bottom. The structure was sound. However, the layout was a source of concern in Mark’s eyes. It felt cluttered and closed-in. There were several blind spots. It was weathered, dated and in urgent need of some TLC. Also, the hot food program was in an isolated part of the store, and required a dedicated staff person to run it. The good news was that the store had a successful fresh sandwich operation, which generated a high volume of sales. A new display gives the sandwich bar a high-end supermarket feel. Mark proposed a vision that would work within the existing space and offer the greatest return on investment. Leasehold improvements included new cabinetry, fixtures, equipment, paint and lighting. Bulkheads were built to provide a visible area for signage. Most significantly, the hot food area was shifted from the centre of the store and moved next to the cash area. Relocating the hot food area had an immediate impact on staff utilization and performance. Regular till staff could now easily serve and monitor the hot food. This eliminated one full time staff position and resulted in greater operational efficiency. The change improved the customer experience by streamlining service and reducing the need for customers to line up twice. The redesign helped take the already successful sandwich program to the next level with the introduction of a sleek and spacious open sandwich cooler. The sandwiches became even more enticing when showcased in a bright, easy to access setting. Most importantly, the owners were thrilled that the renovation came in at the fraction of the cost of a complete rebuild. Business started booming following the refresh and remains strong to this day.